The economy has done even worse than Osborne's critics on the left feared - and now we all have to pay the price. Over a year ago, I co-authored a pamphlet for Compass called ‘The £100bn gamble’ in which we argued that Treasury growth forecasts were wildly optimistic (eg, 2.4 per cent for 2012). “if we fail to grow and instead bump along the bottom at a growth rate averaging 1.3 per cent … over the next five years, we would lose 6.7 per cent of GDP in growth foregone, which is £93.8 billion over the course of this government”. In truth, the 1.3 per cent average we assumed was optimistic. Osborne said yesterday that the economy will in effect experience negligible growth over the next year, while the OECD said yesterday that we’d be returning to recession. The Office for Budget Responsibility (OBR), while pessimistic about this year and next, must be counting on heavenly intervention; it forecasts a healthy 2.6 per cent average for 2013-15, premised on a return to strong growth by the core Eurozone countries. Should the latter not occur, and most observers agree it won’t, the UK economy will most likely stagnate over the entire life of this Parliament. Every bit of new evidence published since the Compass pamphlet on the £100bn gamble appeared suggests Osborne has lost his bet. All the revisions point downward. He is shifting small sums around to give the illusion of chasing growth. In fact, what Osborne wants is what the City of London has always wanted: near zero inflation, low borrowing rates and no Tobin tax. When it comes to social costs such as greater child poverty, shrinking social services, an extended wage freeze, growing unemployment, frankly, Osborne and his banker friends don’t give a damn. According to the National Institute (NIESR), Britain is experiencing a longer depression than in the 1930s. Today, like millions of others, I’ll be marching with the unions. How many members of Labour’s shadow cabinet will join us I wonder? And what about the government’s entire gamble? Spending people’s pension contributions and not investing them. Now the money has all gone, its discovered it can’t pay out. So its defaulting. State pension, state second pension civil service pension …. Even that won’t be enough. If you want a Tobin tax, start with one that is clear that people can see. 1 pound on every ATM transaction. It’s nothing to do with the city. It’s everything to do with politicians of all flavours who have been running the largest ponzi scheme going. That is where the blame lies. Put the numbers to the debts and you will see that is the case. Osborne didn’t prove the doommongers wrong, Osborne is going about making them wrong by doing his best to decimate the economy. He’s doing this so workers will live in a permanent state of fear, maximizing profits for UK multinationals who can offshore their profits avoiding their tax liability. 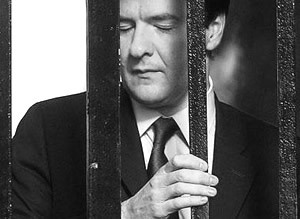 Pure and simple Osborne is looking after his consistuency, the bankers and corporate Britain at the expense of everyone else.